When we drove the Land Rover Range Rove Velar, we didn't think there was any way for it to be any cooler. We weren't expecting Land Rover to reveal a 550 horsepower SVAutobiography edition, which added even more performance to the Velar's already seductive package. With a starting price of just over $112,000 and a limited one-year model run, the Velar SVAutobiography will be extremely special. But what if you want something even more special than a Range Rover from the dealer lot? Land Rover is the not only company taking the Velar and upgrading it to the max. Overfinch has been customizing Range Rovers since 1975 and the company has recently turned its sights on the beautiful Velar. "The distinctive enhancement package from Overfinch retains the elegance and sophistication of the base vehicle, whilst emphasizing the brand’s signature on-road presence," the company said in a press release. Some aftermarket tuners have a tendency to go a bit too wild with their styling packages but Overfinch has managed to push the envelope without going overboard. For the first time ever, customers can select individual parts for their car but the full package includes a carbon fiber grille, front splitter, fog light covers, a spoiler, rear diffuser, branded tailpipes, and 22-inch alloy wheels. If you aren't a big fan of carbon fiber, Overfinch will also offer parts made out of Technical Composite, a lightweight material painted in high gloss black. Overfinch hasn't mentioned any power upgrades, so don't expect any added output under the hood. Velar owners can order their parts online and have them delivered right to their doorstep. The parts can then be installed at a recommended Overfinch partner. 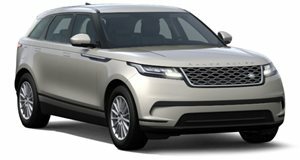 Alternatively, customers can order a converted Velar (either new or used) directly from Overfinch in certain markets. If you want your Velar to feature unique touches not pictured here, Overfinch is open to bespoke requests but don't expect them to come cheap. Filling the midsize gap in the Range Rover lineup between the compact Evoque and pricey Sport.